Here is a shot of the engine diagnostic connector and relay box. Here is the new fuel pressure adapter that we purchased to test the van. The old one "grew feet." and apparently walked away. This is a view of the diagnostic connector. Unfortunately, this car is to early for datastream access. Only codes can be pulled here. Having this adapter installed makes fuel pressure testing a snap. 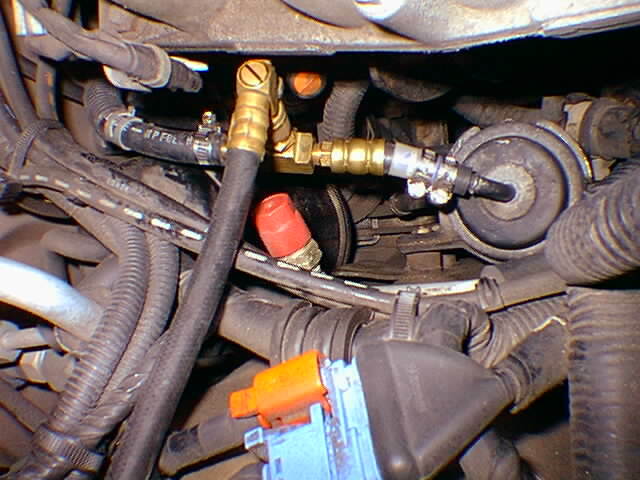 It would be nice if all cars had a Schrader valve built on the fuel line. You can easily access the ECU and COR relay with the right front rug pulled back and the protection plate removed. In this photo, you can see that I have back-probed the blue supply wire to the fuel pump. This is a live view of both fuel pump supply voltage and fuel pressure. 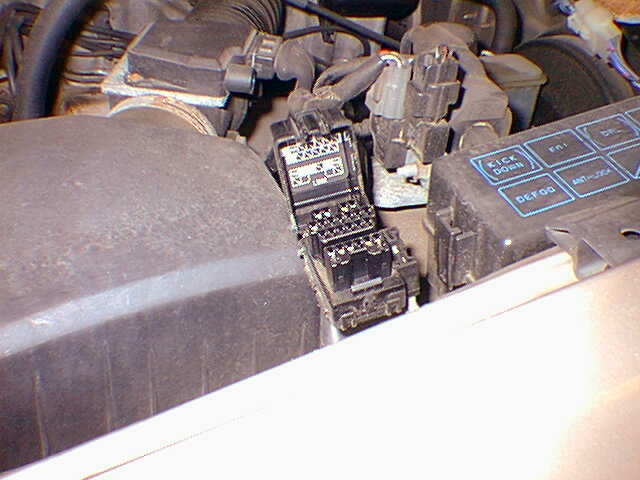 When the car hesitates, we are able to see what part of the fuel circuit has the trouble. Finally the intermittent problem rears its ugly head. The fuel pump's supply voltage is solid and steady, but fuel pressure is taking a dive. One of the easier fuel pump access locations in the normally difficult and complex world of automotive repair. COMPLAINT: Intermittent hesitation and stalling. Mark's First Law states that when business flow begins to increase, problems and headaches also increase in direct proportion. This past January brought a record cold spell here in New England, and with that cold snap came the cars: no-starts, no-cranks, no this, no that, no go. I have always said that a good 10ºF or less cold New England morning will bring the tow trucks out in droves. In that kind of weather, any slightly compromised part on a car that has been concealing itself will be revealed for all to see and repair. We saw the failed batteries, water pumps, alternators, thermostats and the like. However, we also found one of our own shop vehicles was on the blink that morning. 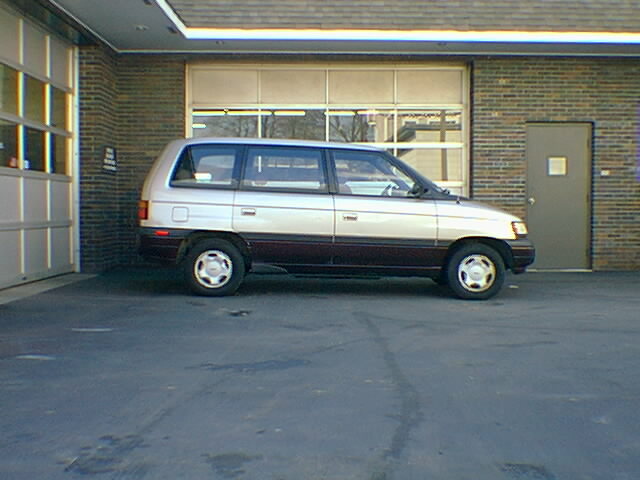 One of our three shop vehicles is a 1993 Mazda MPV minivan with 112,000 miles. These vans come in a variety of configurations: 2WD, 4WD, four- and six- cylinders. Ours is the typical 2.6-liter, four-cylinder paired with Mazda's four-speed automatic transmission. The van is in great shape, and we have done the majority of the service on it. We had initially sold it retail; then, years later, took it back as a trade-in and kept it for errands. Just prior to the cold spell, several employees had started dropping little hints to me about the van's health. Things like: "It hesitates sometimes," or "I told you it stalled last week." And, my personal favorite, "When are you going to check it out anyway?" Not that I was putting anyone off, but every time I drove it, the darn thing ran like a top. Well, it came to the point that I just had to look at it. Everyone was refusing to drive it and that was causing a bottleneck with getting our daily errands done. I decided to take it on a few trips myself. As usual, the van ran strong with no abnormal symptoms. A check for related service bulletins came up with nothing. I figured the easiest thing to do at this point would be to see if the van would communicate with a scan tool. Our scanner said to hook up the Mazda adapter to the diagnostic connector under the hood over the left front fender. Although the van did communicate with the scan tool, only code functions could be utilized. There were no codes and worse, there was no datastream access. 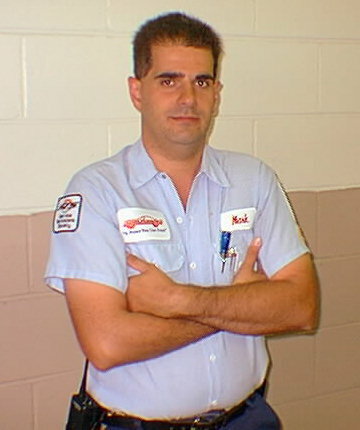 Mark's Law #2: "Vehicles with very difficult intermittent problems will not have access to the datastream." My next thought was to concentrate on the commonalities of all the complaints. This is actually a basic law enforcement technique. When a group of witnesses describes a car that left a crime scene, they will normally all describe something slightly different. As the people are interviewed separately, each may recall a slightly different license plate, which might be, for example, 184XLO, 187XLC and 784XLO. From these answers, a common pattern may emerge. The same applies to the methodology here. Most of the people that drove this van were reporting that it intermittently stumbled, surged and even stalled. The problem happened at any temperature. After more thorough questioning, the drivers all reported that when the performance problem occurred, it was gradual and not a quick "on-off" type action. That small bit of information spoke volumes to me. At first I was thinking that the van might be losing ignition. However, generally ignition loss symptoms are of the quick on-off type symptom. It appeared that a fuel loss might be the first thing to consider, because its symptoms are gradual by nature. The valuable datastream information was not available, so I had to start somewhere. Fuel tap? What fuel tap? The first thing to do was to connect a fuel pressure gauge to the vehicle and continue driving it. I popped the hood and looked for the fuel tap. Fuel tap? Oops, there I go again thinking of my past GM repairs. 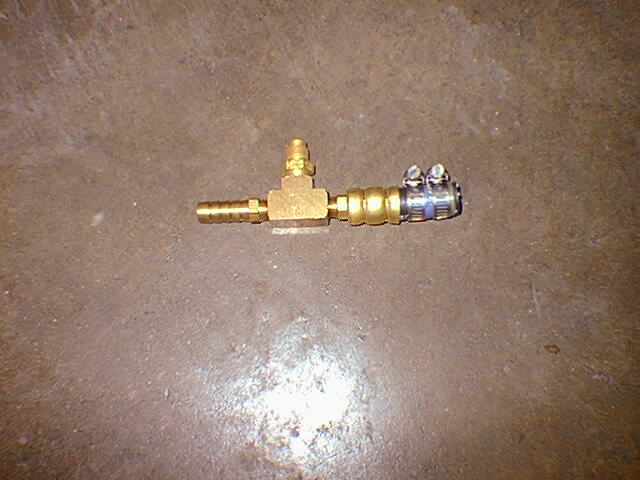 The Mazda 2.6 engine does not have a separate fuel tap or Schrader Valve connection. However, with our trusty master fuel pressure gauge kit, we can hook up a fitting that will allow us to "T" into the fuel system. Well, at least I thought I could. A look in our fuel pressure kit revealed that the adapter I needed was missing. I was experiencing something we are all too familiar with in this industry: Missing tools that were either "borrowed" and never returned or were put on a car for testing purposes and never removed. After a frantic call to our tool distributor, we had the replacement fitting that same day. Normally, I tape the fuel pressure gauge to the windshield, but in this case it was easier to read when it was attached to the radio antenna. It wasn't the best duct tape job, but it stayed on the antenna at highway speeds so it worked for me. According to our technical information service, normal fuel pressure (regulated) on this engine is 30 to 37 psi with 18 to 21 inches Hg vacuum at the fuel pressure regulator. Although I went through five test drives with no running problem I noticed a trend in the readings. 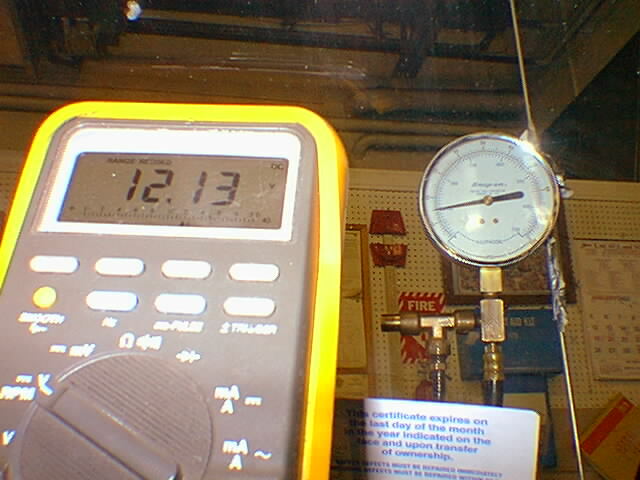 During the road tests, the gauge would bounce at times from 24 to 32 psi. Then, the pressure would be a steady 34 psi. Although there seemed to be an abnormality on the fuel pressure circuit, the car was not symptomatic. Also, something else interesting was occurring. As the fuel tank got lower on fuel, the fluctuations periods became more frequent. I have found this can often be the initial symptom of a tired fuel pump. There is some data to support the theory that the heat of fuel pump operation is lessened when the pump is completely submerged in fuel. As the fuel level drops, more of the pump becomes exposed and the internal pump temperature rises. What is not an issue on a healthy pump becomes a major factor on a failing pump. There were still some problems to overcome. No testing had been done to see if the fuel pump was receiving adequate supply voltage. Another trip to our technical service information proved interesting. Fuel pump power on this van comes from the circuit opening relay (COR). 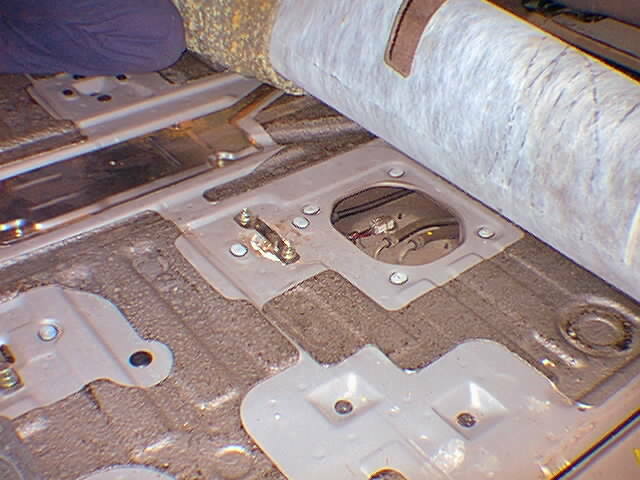 The COR is mounted next to the engine ECU on the right front floor under the rug below a metal protection plate. The COR is a five-wire relay. The black wire is ground to the relay's coil when cranking. That same coil gets power from the starter circuit on the green/red wire during crank. The blue/green wire is ground for the relay's coil when running. That coil gets its power from the ECU on the black/white wire when tachometer signal is present for normal running. 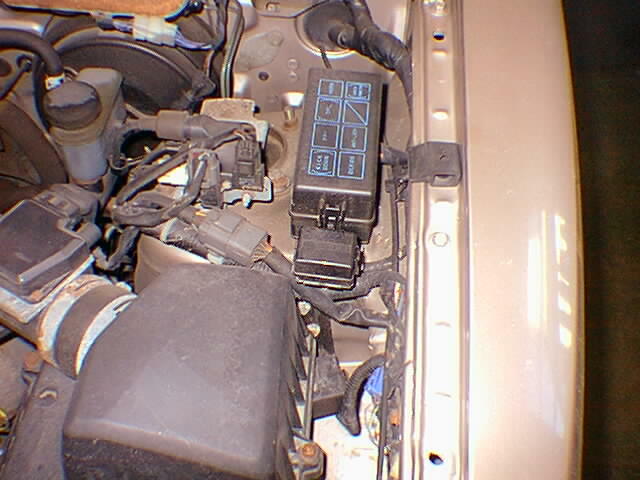 Finally, and most importantly, the solid blue wire sends power to the fuel pump when the relay contact closes. After another two test drives the car was finally hesitating. During these events, the fuel pressure dropped to 12 to 18 psi and the voltage to the pump remained a constant 12.4 volts. Even though all the variables had not been eliminated, our tests pointed to an intermittent fuel pump problem. 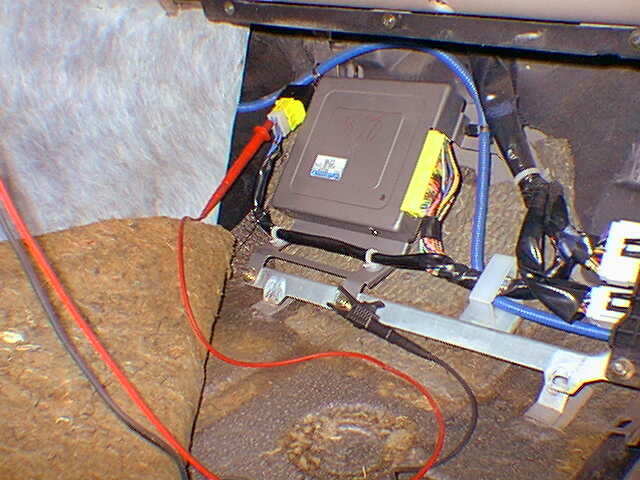 Obviously, the best diagnostic test would be to hook up power and ground test leads as close to the pump as possible.A fuel pressure volume test and an amp draw test can be performed as well. Given a busy day's time constraints combined with this industry's escalating labor cost per hour, it is often more acceptable to perform tests at a remote, more accessible location, hence the method to my madness. As a final protective measure we installed a new fuel filter. It was a good thing we looked up the procedure to change the fuel pump; otherwise, we would have dropped the tank for nothing. As typical with Asian engineering, the pump access plate is located within the cabin under the #2 seat.